Tis the Season once again on Vintage Indie and today just happens to feature a little bit of this and a little bit of that. After stumbling upon The Old Painted Cottage it was hard to choose which items to feature, hence the title. 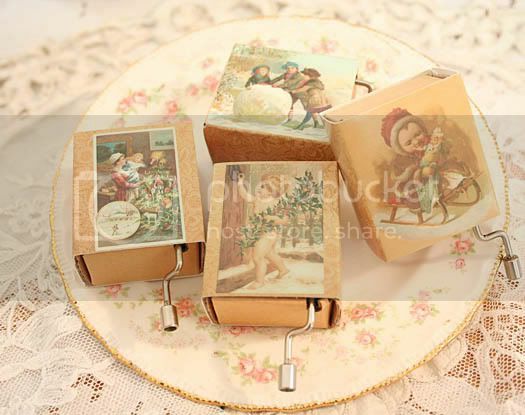 First up, perfect for the holidays are these adorable Antique Holiday Music Boxes. Each one plays a delightful sound with the turn of a handle. Can you imagine the look on a child's face with this tiny little treasure. I'm just in love with them. Not sure if this next one would be for you or a little one, but it would look darling on a wooden bookshelf in a child's room. This is a Shabby Old Music Xylophone. I love the chippy look and the colors. Lastly, this is the "little bit" of that part that I just couldn't pass up. The Old Painted Cottage offers a very nice selection of shabby jammies that you will adore. These are the Frankie & Johhny Pink Roses on Blue Cotton Pajamas. Perfect for sipping coffee while you open gifts on Christmas morning. I hope you enjoyed The Old Painted Cottage. Head over there for many delightful Vintage, Antique and new treasures. Hi! I just found your site via French Garden House and I just love it! I will be back to do more reading~~your banner is beautiful! I just wanted to thank you again for doing such a beautiful post about my site & my products! Love the vintage music boxes! Jen's PJ's look comfy!